Give the gift of friendship and tenderness with a Giant Teddy stuffed teddy bear like Sunny Cuddles. An extremely cute and huggable teddy bear with a heavenly plush mocha brown teddy bear coat. Its big brown eyes are filled with a lively twinkle, an expression of the love and kindness that extends to Sunny's new home! Its chubby nose is made of smooth velveteen fabric; divinely soothing to the touch. This precious bear measures 46" in height and is also available in larger and smaller sizes in a kaleidoscope of colors. It wears a dashing checkered bow that adds the right touch of whimsy to its design. Being well constructed, durable, made with child safe fabrics and meeting or exceeding all US safety standards guarantees that Sunny Cuddles is perfect for snuggling! A wonderful collectible, as all Giant Teddy bears are! Absolutely lovely teddy bear as described! Wife loves it alot! This is a pretty great bear. My daughter loves it. We looked around a lot at other options online but were worried about the quality. We got to experience some other brands of giant bears recently and that made us appreciate this purchase even more. It's pretty sturdy fabric and doesn't skimp on the stuffing. We also really like that face, bow tie and proportions. Some of the others we saw had really long legs that just didn't look right. This one is pretty perfect all around. 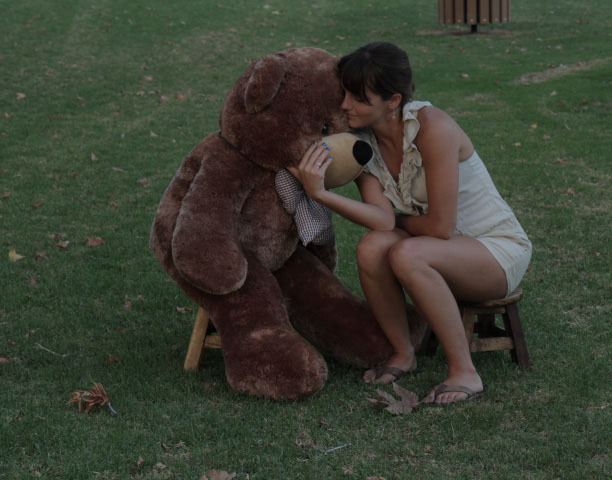 I was very happy with the whole process of purchasing from Giant Teddy. The packaging was great (vacuumed sealed to reduce size). I opened the delivery bag and the bear literally sprung to life. no creases, wrinkles or dents. The bear is as soft as advertised. My 3 yr old niece LOVED it, and promptly named it Mr. Bear. Gave this to my wife for her birthday and she couldn't be happier. My daughter absolutely loves Sunny Cuddles bear. He's super soft and appears to be made very well. Unpacking him was a surprise because he's shrink wrapped and expands hugely when the bag is unzipped. Actually scared my daughter a little....super funny! Gave this to my niece, she has been wanting a giant teddy....she loves it, very soft, big, and cuddly. It came in a small square box I could not even imagine a giant teddy bear coming in but when I opened it up it turned out to be HUGE!!! My daughter loves it!